Northwest corner. The columns, eight on the short sides and 17 on the long, follow the conventional formula of 2n+1. They are 34 feet tall, on centers 14 feet apart, and they taper from a base diameter of 6 feet 2 inches to a top diameter of 4 feet 10. 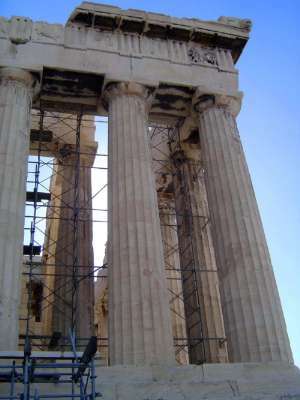 They slant inwards about 2 inches and so are not quite vertical: if projected upwards, the columns of the east and west facades would converge at a height of 15,000 feet. The corner columns, in addition, are 2 inches thicker than the others, with a reduced space between them and their neighbors.